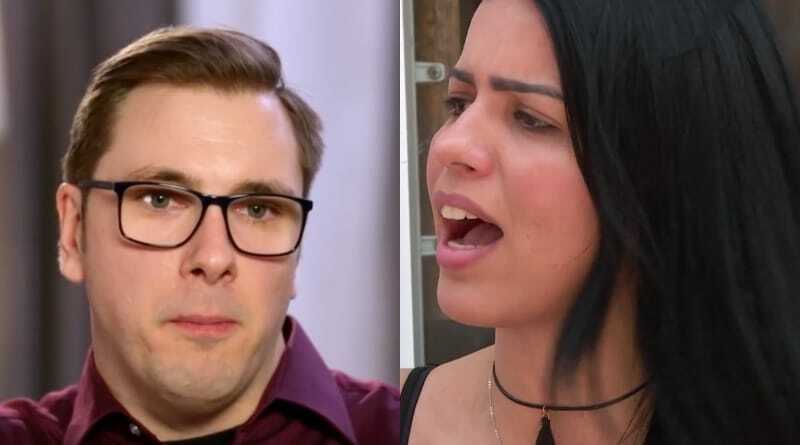 90 Day Fiance star Larissa Christina recently backpedaled hard to refute her prior claims that Colt Johnson was using and stealing from her. It was a complete Instagram turnaround when compared with everything else that’s been coming out of late. Does Larissa have a change of heart or is there something more to the story? 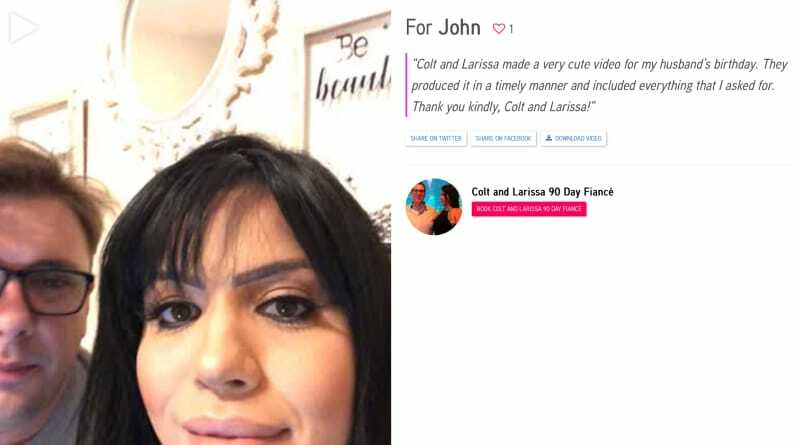 Larissa Christina claims “Colt never stole money from me, I misunderstood and I was angry.” The 90 Day Fiance couple has been embroiled in a cheating scandal with Colt messaging a number of women online. In addition, fans joked that one of the alleged women looks like a Larissa downgrade. Colt admitted that he has a problem, saying that he’s going to fix his marriage privately. Given this recent scandal, it’s interesting that Colt Johnson and Larissa are choosing to put on a united front, but there does seem to be some financial incentive behind the moves. Larissa goes on to add: “I’m not allow to work so we will start to save in our bank account it and I’m just there per request. So let me know if you want us together or one of us alone in the video.” Also, does “our bank account” refer to the joint account they share with Mama Debbie Johnson? 90 Day Fiance: Larissa and Colt desperate for cash? Larissa seems to have pulled an about-face with her latest message. It’s a sharp contrast to her previous messages in which she essentially beat Colt up all over social media. Are they desperate for cash? 90 Day Fiance only pays $1,000 per couple per episode, according to our inside sources. Are they having to work together to make ends meet? According to their cameo page, they have a 4.9 rating out of 5 stars based on 35 reviews. 90 Day Fiance: Rocky relationship on the mend? Between Colt wanting to fix his mistakes and Larissa taking some time away to heal, it’s difficult to know where things currently stand for the 90 Day Fiance couple. Their cameo page doesn’t list publish dates, but they’ve had an account on the website since November 2018. Despite their personal issues, it looks like they’re collaborating on this joint venture just fine. 90 Day Fiance‘s Larissa Christina appears to be all smiles with Colt Johnson in the Cameo videos. But it wasn’t too long ago that she was “destroyed” by his alleged lies. Larissa claimed a few days ago that Colt was using her for profit and that she hasn’t seen a dime from them. 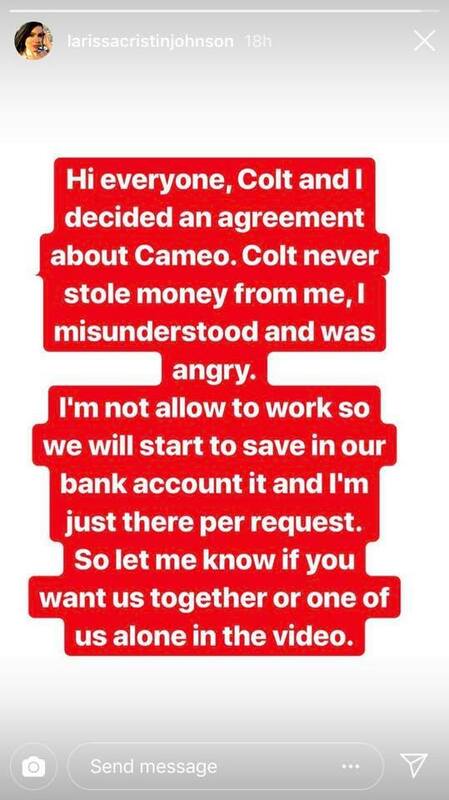 Now, she’s claiming Colt never stole from her and she’s encouraging people to book them. This tangled web seems to only get more twisted by the day. Tune in to a new episode of 90 Day Fiance Sunday at 8:00 PM only on TLC. Check back with Soap Dirt for all the latest 90 Day Fiance spoilers, news and leaks.